Aah, the tasteful embellishments of the era — fuzzy trim, plastic, and alien faces. 1. Holograms + mini size + clear strap. So much going on. 2. Obligatory inflatable backpack. Yes. 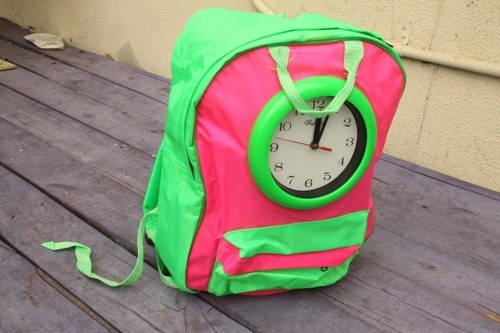 This is actually a backpack and not an alien pod. 3. This smiley face plastic backpack matched your smiley face notebooks, pens, sheets, bedroom, life, ahhhhh!!! 4. Here's another mini-purse for you to wear to the dance. 5. This is very Posh Spice. 6. Here's an option you might still consider wearing...wait...nope. 7. Lisa Frank aliens. Mind explosion. 8. OMG astroturf. You had so much astroturf. 9. And daisies. 'Cause Drew Barrymore. 10. A 90210 fannypack? This is the epitome of the '90s. 11. The combination of two trends — smiley faces with clear backpacks. 12. This bag is too bootylicious. 13. The sparkles make a subtle addition to this studded mini-bag, don't you think? 14. Of course, a more girly gingham variety is also lovely. 16. Ahh, the ever-popular circle purse. Adorned with happy flowers, no less. 17. Fake flower adornments are good, but screenprinted daisies on a drawstring bag? Much better. 18. A must: the Chinese takeout purse. 19. Lisa Frank, how you so good? 20. Here's your casual, everyday purse. 21. OMG LISA FRANK EXPLOSION. 22. Meet you at the rave later! Don't forget to bring the pacifiers! 23. This is very Scary Spice meets Clueless meets eighth grade. 24. Aaaaaaannnd this is a Game Boy fannypack. 25. How does this make sense. 26. Oooh, mesh. Mesh is your favorite. 27. Here's another totally cute thing to wear to the rave. 28. School is so whatever but at least you look amazing. 29. To pair with your leather jacket and circle sunglasses. 30. And, to end, one last mini-purse. All hail Mini-Purse!